Kenyan rapper CMB Prezzo with Tanzanian video vixen Amber Lulu. 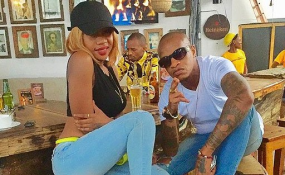 Rapper Jackson Makini, popularly known as CMB Prezzo, has been dumped for the second time by his famous Tanzanian socialite and video vixen Amber Lulu, barely six months after they reunited. Speaking to Refresh TV program, Amber Lulu said she decided to end her hot relationship with the celebrity rapper for the second time because she just cannot keep up with him and his lifestyle. "Unaona ukikaa sehemu yeye bado yuko yuko tu. Yani humwelewi elewi tu. Yaani yupo tu sawa sijui kwa nini? Yaani nadhani tu jina Prezzo halafu inakuwa nini?" Amber lamented. Amber broke up with Prezzo early last year saying there was no true love in their their public affair and that she felt they were just wasting each other's time. However six months later she made up with the controversial rapper saying she had missed him so much and that he was ready to welcome her back. Before starting his steamy affair with Amber, the former high-riding rapper had dated socialite Michelle Yola for two years before being dumped by the petite lass who later got hitched to a Caucasian boyfriend.